Mehul Malik is an Assistant Professor of Physics at Heriot-Watt University, Edinburgh, where he leads the Beyond Binary Quantum Information Laboratory (BBQ Lab). He currently holds an EPSRC Early Career Fellowship and leads a European QuantERA consortium studying quantum phenomena with complex media. His research interests include quantum information processing and communication, fundamental studies of entanglement, and complex scattering media. Prior to Heriot-Watt, he spent five years in Vienna—as a Marie Curie international incoming fellow in the group of Prof Anton Zeilinger at the University of Vienna, and a senior post-doctoral fellow in the Quantum Information and Thermodynamics group led by Dr Marcus Huber at IQOQI Vienna. 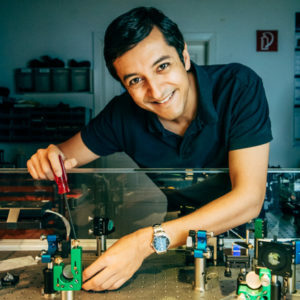 Mehul’s post-doctoral research included the creation of the first ever multi-particle entangled state in high dimensions, and the development of a new measurement technique for quantifying high-dimensional entanglement with only two measurements. Mehul was born in New Delhi, India and completed his PhD in 2013 with Prof Robert Boyd at the University of Rochester, New York.